Oldcastle Meath GAA Club has a long and treasured pride of place in the history of the GAA in Meath, this history and contribution is best captured by Tommy Sheridan (Editor) in ‘The History of Oldcastle GAA Club 1884-1984’. Oldcastle Meath GAA Club is at the heart of the community and provides opportunities and services for all ages and genders, from the under-age Gaelic Teams to Bingo on a Wednesday night in The Show Hall for older members of the community. Oldcastle Meath GAA depends on raising funds to keep its services successful, this means that the weekly Blotto is very important to the club and everyone is encouraged to buy a €2 Ticket each week and have the opportunity to win €1000s of Euros for your small but welcome contribution. The Bingo in The Show Hall in Oldcastle every Wednesday night is also run by Oldcastle Meath GAA and while the Bingo is part of the fund raising activities of the club, it is also a social event where many people come together for the weekly chat. 11-02-11. Meath GAA Annual Awards Presentation Dinner 2010 at the Ardboyne Hotel, Navan. 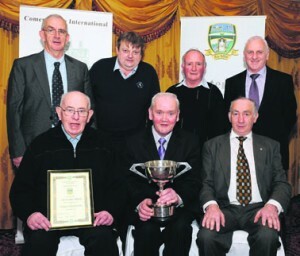 Oldcastle GFC Meath GAA Club Grounds of the Year award winners L to R.
Back: Eddie O’Reilly, Treasurer. Peter Caffrey, Gleneagle (Sponsor), Larry Smith, Grounds Man. Brendan Walsh, Development Committee. Front: Brendan Smith, Secretary. Leo Halpin, C’Man. Barney Allen, C’Man. Meath GAA Co. Board. ©John Quirke Photography, Unit 17, Blackcastle Shopping Cte. Navan. Co. Meath. 046-9079044 / 087-2579454.